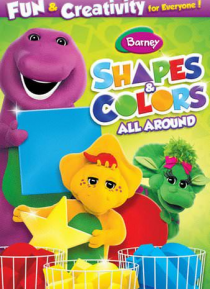 BARNEY: SHAPES & COLORS ALL AROUND - Barney, BJ(tm) and Baby Bop(tm) invite you on a rainbow adventure filled with shapes of every hue. Explore new colors and get your toes tapping to create your own art show. Banjo music will have you square - dancing with rhythm and blues. Join Barney for a colorful celebration and learn about all the shapes you can find in your very own room.